Conversion rate optimization for achieving your business goals FAST!! How to increase conversion rate on your website with a visible proof to the visitors? Having an online business is not a child’s play anymore. With billions of users, the internet has turned into a village that has kept everyone connected to everything. In this dense village, it is really difficult to convert visitors into customers/subscribers. The conversion rate is something that can make or break your efforts on retaining a visitor so as to make them a customer/subscriber. I’ll tell you a small story related to conversion rate to make you better understand this stuff. In the initial days when dairy milk was growing in the market, the owner John Cadbury took his little daughter to the store and asked her to buy any chocolates she liked. He expected her daughter to ask for Cadbury dairy milk as it was a well-known chocolate back then(thanks to the commercials). To his surprise, she didn’t. She bought some other chocolate and left the store. John thought a lot and finally came to know the reason behind this. His daughter didn’t even see the Cadbury, as they were placed at the top of the shelves. Being a brand he wanted his products to be placed on the top shelves on the supermarket. Since this day, he changed a small thing and experienced a huge conversion rate than before. He made it mandatory for all the supermarkets to place Cadbury’s products on the bottom-most shelf so that it’s visible to all. He did this change and bang!! His conversion rate shot up, sales went up and so did the production. He saw a sharp revenue growth with this small change. Now that you understand the importance of conversion rate, let me define it to you in and talk more about what is conversion rate and how can it help to upgrade the SEO game. Conversion marketing is the act of marketing with the intention of increasing conversions, that is, site visitors who are paying customers. The process of improving the conversion rate is called conversion rate optimization(CRO). That pretty much sounds concrete for newbies, let me dilute it a bit. Conversion Rate is the percentage of visitors becoming assets (depending on your site goals) to you. It can be in terms of sales, sign-ups, subscriptions and all such goals that mean to you. The reason why many people are revolving around CRO is the fact that this tells you about the behavior of users on your website. Read also: What is semantic search? Why does it matter in your SEO campaign? When it comes to having a business website, it has a lot of things to take care of. Some of them include the content, design, services, user experience and a lot more. Having said that, your business website has goals to meet and the successful accomplishment of these goals is the “conversions”. This conversion should not be confused with conversion rate in SEO, i.e. paid ads. In that case, the conversion happens when someone clicks on your ads or your URL in organic search results page. The conversion we’re talking about in this post begins after someone visits your website. However, both the conversions are totally in your control but in different proportions and manner. How Conversion rate optimization helps SEO of your website? Increase search traffic: Not directly but a good CRO can help you determine what makes users interact with your CTAs on your website. Once you know it, you can do more of it may be in different fashion. You can always experiment with this stuff. More the users interact to convert, more their behavior help us improve the onsite SEO. Good user experience: What CRO helps you understand is what part of your website gets the most interaction. You can use this fact to reverse engineer and build a great user experience. You have to come up with features and elements that are present in various parts of the website. Each of those test elements should be capable enough to make visitors take actions. This action is the data you wanna play with. Reach more people: Say you have a subscribe box on your homepage and the CRO is super awesome hence you have a good number of people subscribing. This high CRO results in increasing the user base. While the user base increases in parallel, you have more and more people joining your email list. You can target them and bring them back to your website, this way the traffic increases and hence the SEO. Read Also: What is Google Adwords? How to set up a perfect ad campaign on Adwords? How to improve conversion rate for good? Now you know how important CRO is for your online businesses, and you’re eager to improve it for good. The conversion rate is one of those metrics that has been in every webmaster’s eye lately. Because of the high return rate conversion rate is really considered as the most important matrix of all. So let me introduce you to 8 ways and 1 tool that will skyrocket your conversion rate for sure. Let’s begin. You’ve written the content to make an impact on readers and pitch your product or service so gotta make them move their muscle, let’s begin this by taking some action on your blog post. A read more tag, a subscribe pop up, viewing the slideshow(s), commenting or anything CTA that can make your readers get one step closer to your goal. Including a “Read also” interlink can do wonders. It not only helps you increase the session times and reduce bounce rates, it can help you make your readers accustomed to performing some actions. Doing such micro-conversions will make them trust your website. How? Wouldn’t you trust a website that shows you exactly what you anticipated? Well, this requires you to have the title of the interlink a truth, nothing exaggerated. Furthermore, people are being used to banners and over 90% of them straight away ignore it. So it’s better to have a textual call to actions. This will work better than the banners. Let us agree, content marketing is the key to greater ranking on any search engine. This makes obvious that content marketing becomes kinda mandatory. If you’re not into this yet, get into this race as soon as possible. Content marketing is the golden opportunity of storytelling that lets you capture reader’s attention. Now it depends on you how well or not you do this. Content marketing is the cheapest way of marketing and one of the most efficient way to get in front of your target audience. I’m sure not all of your posts perform the same way, some do good some don’t. So if you have a handful of the best performing, choose the best of the best out of that and further optimize it. By optimizing I mean to cover the gaps that were left in the first place. One of the quickest ways to do this is getting impression data from Google Search console or Bing webmasters and include the best keywords out of them. Just get the keywords your posts are getting impressions for, do a keywords research from google trends, keywords planner to find which of them have high search volume. Since this post(s) is already performing well, its fruitful get the conversions from these posts. Once you have these posts revived, include the latest conversion rate optimizers in these posts. This is an interesting part and this requires a lot of filtering and research. You have to target the repeated visitors by running an ad of your business and since they’ve already visited your website already a couple of times it’s more likely that they’ll see your ad and get back again. Either of the cases, you have to have the CROs ready to capture them. A homepage is a common place they’re likely to visit so its not of a big headache. All you have to do is, optimize your high performing blog posts as mentioned above. If possible optimize all the blog posts, starting with high performing ones. In 2008, Obama’s team split tested the website of his presidential campaign. They tried 24 different versions of the same website and they had a winner which got them 2.8 million more email addresses and rest is history. This is how A/B testing is. It lets you test the best version of your idea that “converts”, the key is to change only one thing in each combination. You can have any number of combinations depending on your idea. If you change multiple things in each variation, and it performs better how will you know what exactly caused this performance? Make sure you enough data to get meaningful results. A/B testing with 3 rows of data is going to land you in trouble. This online has brought everyone together undoubtedly but the trust rates have gone down. Interestingly, it’s turning out good now. If gaining trust online was that easy, then no newcomer would’ve dared to join the league of online business. Talking of CVP, it is self-explanatory of what it is for. CVP is an entity that describes the added value to the customer that no one else cannot provide. Questions like “Why should I buy from you?” or “Why should I subscribe?” are a part of a good CVP. This funnel pretty much explains the whole process. You have to begin your CROs with this funnel in mind. 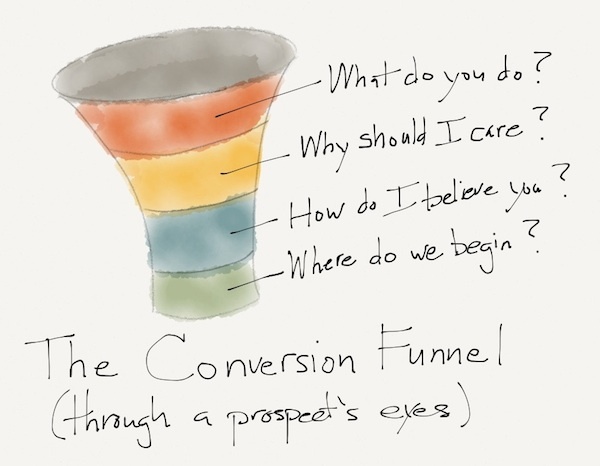 Answers to these questions for your business are the key to a great sales funnel. When a user arrives on your website, he/she is blank. They were expecting a relevant website to come up and it is your duty to make them feel home. There are some great examples in your niche with great CVP. A great CVP is nothing but a webpage that answers all the questions in the funnel above. The more creative you get more are the chances of your win. CVP is the classic element to A/B test, get your minds to work and think like your customer. The users are busy, they’re faster than you think. They’ve shorter attention span and higher expectation. Don’t disappoint them with irrelevantly relevant content. You own a pet food website, visitors come to your website and expect products that their pets would love. It is your duty to do exactly that if you are looking for business. You cannot welcome them with a dog wagging his tail. The visitors see the dog, it’s cute and appealing. But they’re here for food for their pets, it would be better if you resonate with their needs and show them what they want. This requires a little bit of anticipation and a bit of smartness. You can anticipate that the users are pet owners and they’d be looking for food and nothing else. Your smartness is when you show them the food along with why they should feed them your products. Firstly, they’ll feel confident that they’re at the right place. Secondly, they’ll feel safe with the food quality. Keep it simple and straight, no ifs and buts. This works perfectly for almost any website. Even the newest website can get this done. You just have to creatively make the users take action by creating an urgency. The paradox of choices, says when people are not given many choices they tend to choose for sure. This trick is one of the best in my knowledge when it comes to Converting visitors into customers. Like a CTA would say either to share the content on the social network or subscribe. Chances are that they’d do either of it for sure. “Last few hours left” is a classic example to explain this to you. Remember, a sale on your favorite shopping site that comes every other week with a “lightning deal”? This has worked enough for them to make few quick million dollars in a matter of days. Try the same on your website to see wonders. Test all your ideas, one at a time. A study conducted by Dan Ariely, where two counters with Jams were set up. One store had 24 jams to taste and other had 6. The store with 6 jams saw a 30% of conversion while the store with 24 types of jam saw only a 3% of conversions. Pretty convincing right? The most difficult part about selling is build trust. If you can build trust with your target customers, you’re halfway through. While it becomes obvious that have to have a quality product that can be a catalyst in building the trust. If I am using a $400 suit, it better be awesome. Exactly the way I want. No plus or minus is entertained. In this case, I am the customer and I have all rights to demand. If you as the seller can take care of my wishes and requirements, I may become a repeating customer. Comparison between you and your competitors. Think like a customer. How would you trust any product that you’ve never bought? What will the answers you’d be looking for before making any purchase? Answer those on your website and you’re through. Humans are imitant. We tend to imitate something we “SEE”, either mentally or physically. Sooner or later, we do imitate. In the previous point, you saw how important building trust is so that a visitor converts to a customer and your conversion rate is high. Talking of which, proof that your service is used by many globally can come handy to achieve whatever the goal of your business is. Subscribers, sign-ups, check-in, download, purchase, sell, or whatever you need. Let us have a look at how Proof can help you achieve higher conversion rate. Activity notification: Display recent sales, sign-ups and opt-ins that will drive a visitor to convert as they’re seeing the “Proof” on your website. Live visitor count: If your intention is to make the visitor sign-up for a newsletter, this is the best way. You can show the live visitor count that can make them sign up. Customer journey: You can watch the roadmap of the customers that they took while actually completing the CTAs. Mobile friendly: With mobile usage nearing 70%, Proof works just perfectly on mobile to give your mobile visitors a rich experience. Basically, this tool can help you capture conversions with social proof. Just install the script, set the rules and you are through. This tool will take the load of marketing your website with the social proof and increase conversions drastically. The best part?? This tool is useful for anyone who’s planning to grow the business online. You know everything about conversion rate now. All you gotta do is bang on with creative ideas and start converting. You know how important conversions are so why not invest time and efforts in increasing conversions the easiest way? And a fantastic tool, Proof that can smartly convert and retain customers on your business. Over to you. Do you have any other methods that have worked well for increasing conversion rate on your website? Have you tried something out of the box that has increased your conversion rate? Let me know in the comment section below. Let me learn from you. Do you know someone who’s looking for this information? Share this with them also share in your network.